Writing in social media is different from regular writing. You must remember this. There’s nothing wrong with texting with just your thumbs. It’s fine to use all lowercase letters in tweets and status updates. Feel free to use shortcuts like IMO, LOL, 2nite, and OMG when commenting on blogs. Just be aware that none of these habits are acceptable in formal writing situations. The rise of social media has many bemoaning the end of English as we know it. They view this new means of communication as a threat to traditional English conventions. But that need not be the case as long we understand that context is everything. Know what rules you are violating in an instant message so that you will be able to stick to them when the situation demands it. 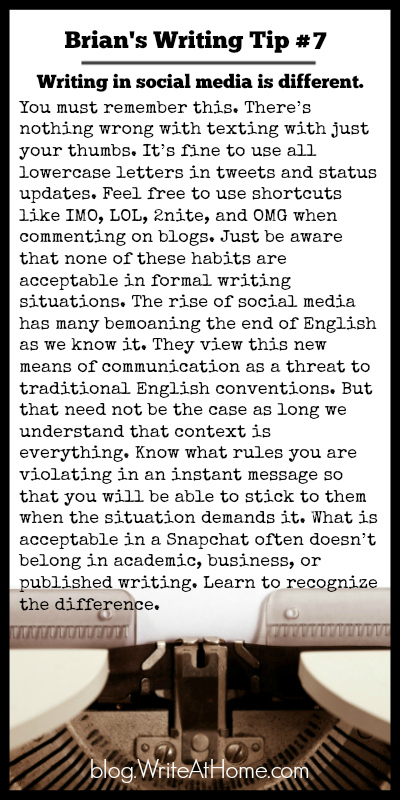 What is acceptable in a Snapchat often doesn’t belong in academic, business, or published writing. Learn to recognize the difference. Bloggers love comments. Really. Leave yours below. Social media conventions are welcome! Brian, thank you for your articles! They help me to improve my writing skills, though I still make many mistakes. I’m from Russia, and we have here so called “язык падонков” (“scum language”) among Internet nerds. It’s a metaphorical language used to express one’s thoughts in a way difficult to read, but preserving phonetic image of a word. It’s similar to the “txtslang”, but the main cause of distortion of words here is not a necessity to shorten them, but a deliberate intention to disfigure words in order to make them look funny or express one’s disdain for a subject being discussed. The older generation sounds the alarm, as this style of communication among youth is becoming very popuar. So, we have similar problems. But as for me, I think, it’s not a big deal, since those who use the scum tongue are in truth more literate than the others or on the same level and able to switch between scum and normal style in an instant if necessary. The language is evolving, developing, and it can’t be helped.